We reported a replica California gold piece with bear reverse, as we customarily do–using Proxibid’s “Report this Item” function–and were glad to see the replica coin withdrawn. But we disagree that it was described properly. Many of our top houses in the past year have been coin dealers. On the one hand, they usually describe coins numismatically. On the other, they not only have to answer to Proxibid but also to professional organizations, such as the Professional Numismatists Guild. 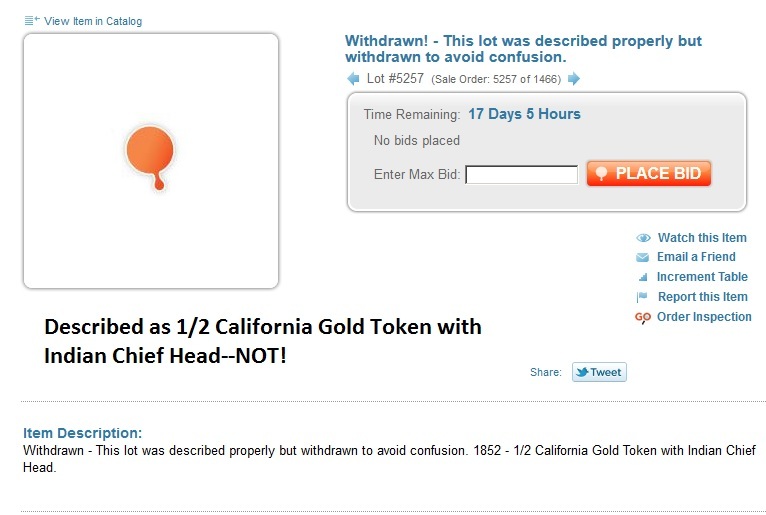 As many of our viewers also know, we have waged a battle against fake or replica California fractional gold pieces turning up regularly on Proxibid because eBay has banned the sale of them on its portal (though they are still there, if you look hard enough). Ensure that the lot is “gold” before using that word on any lot or you will be found in violation of the Unified User Agreement for not describing the fake accurately. “1852”, unless you can prove the year (which in this case you cannot because no bear reverses were minted then). “California Gold” unless you can assure everyone that (a) it was minted in that state and (b) are positive this is not plated brass or other base metal. See our most popular post–“California Gold: Real, Replica and Fake“–which typically registers between 50-100 hits per week. We were disappointed in the auction company for being defensive in maintaining that it had properly described a replica. It did not. Almost all replicas and counterfeits of California gold have a bear reverse. Very few are from “Hart’s Coins of the West.” Many are jeweler’s tokens sold as souvenirs of the West in the 1930s. Those are made of cheap gold, brass or plated base metal. Proxiblog will continue to report replica and fake California fractional gold as we encounter them. And we continue to applaud Proxibid for listening to us in this regard, as this post illustrates. This entry was posted in News and tagged American Numismatic Association, Auctioneers, AuctionZip, Best Practices, california fake gold, California gold, california replicas, california tokens, Coin Auction, iCollector, National Auctioneer Association, PCGS CoinFacts, PNG, Professional Numismatists Guild, Proxibid, Proxiblog. Bookmark the permalink.